1. What is the Linksys EA7500-AH v2 Max-Stream™ AC1900+ MU-MIMO Gigabit Router? 2. What do the LEDs on the Linksys EA7500-AH v2 Max Stream™ AC1900+ indicate? 3. What is the warranty period of the Linksys EA7500-AH v2 Max Stream™ AC1900+? 5. What USB standards does the Linksys EA7500-AH v2 Max Stream™ AC1900+ support? 6. What is the recommended antenna position for the Linksys EA7500-AH v2 Max Stream™ AC1900+? 7. What is the Network Map feature of my Linksys EA7500-AH v2 Max Stream™ AC1900+ and how can I use it? 8. Can I wall-mount the Linksys EA7500-AH v2 Max Stream™ AC1900+? 9. What is the Wireless Scheduler feature of my Linksys EA7500-AH v2 Max Stream™ AC1900+ and how can I use it? 10. What processor does the Linksys EA7500-AH v2 Max Stream™ AC1900+ have? 11. How much flash storage and Random Access Memory (RAM) does the Linksys EA7500-AH v2 Max Stream™ AC1900+ have? 12. What processors do the Linksys EA7500-AH and EA7500-AH v2 use? 13. 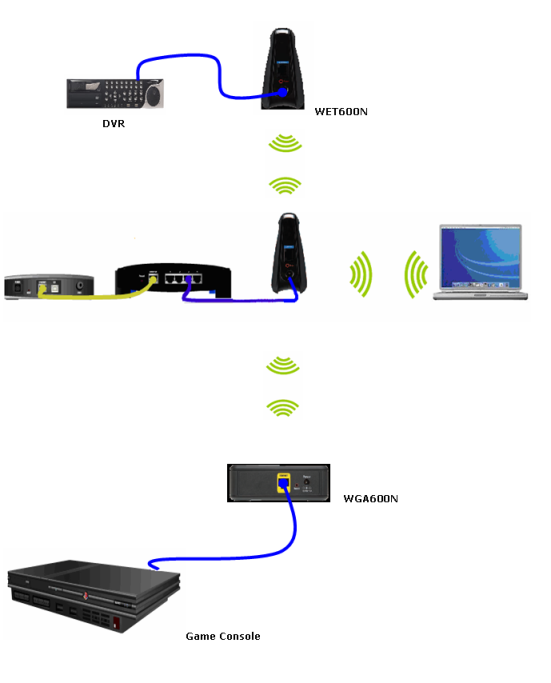 How many antennas do the Linksys EA7500-AH and EA7500-AH v2 use? 14. What max. Wi-Fi speed do the Linksys EA7500-AH and EA7500-AH v2 deliver? The Linksys EA7500-AH v2 Max-Stream™ AC1900+ MU-MIMO Gigabit Router is a MU-MIMO Ready Dual Band router with two (2) USB ports (1x USB 3.0 port and 1x USB 2.0 port). It supports a maximum speed of 800 Mbps on the 2.4 GHz band and up to 1733 Mbps on the 5 GHz band. This router comes with three (3) external detachable dual-band dipole antennas and one (1) internal antenna for enhanced dual-band communication, better coverage and range. The antennas are adjustable to customize your wireless signal for single or multi-story buildings. For more information about the product features and specification of the Linksys EA7500-AH v2, click here. The LEDs indicate the different activities and status on your router. The warranty period is 3 years. The Linksys EA7500-AH v2 has both USB 3.0 and USB 2.0 ports which are capable of supporting an external hard disk or flash drive with up to 1100 mA current draw. These ports support FAT, FAT32, NTFS and HFS+ journaled and non-journaled file systems. Single-story homes – All three (3) antennas are positioned straight up. 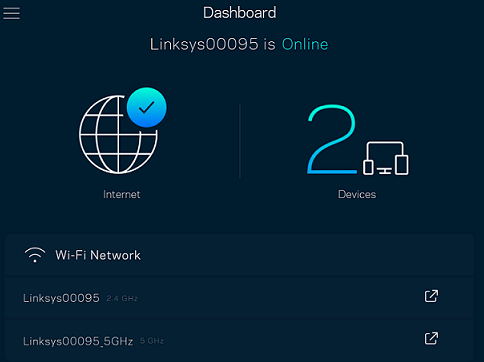 The Network Map feature of your Linksys EA7500-AH v2 allows you to manage and monitor your devices’ connection to the network. To know more about this and how you can use it, click here. Yes. 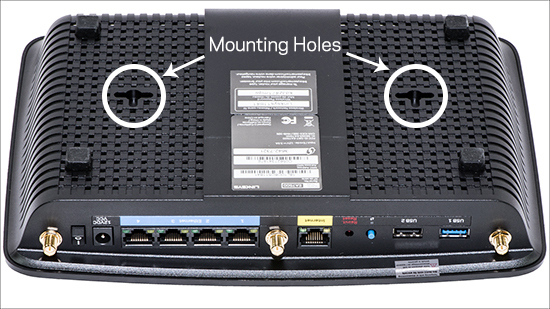 To know how to wall-mount the Linksys EA7500-AH v2. Some of the Linksys Smart Wi-Fi Routers and the LinksysEA7500-AH v2 have wall-mount slots at the bottom of each foot for flexibility in mounting the device on the wall. The distance between the slots on the short side is 104 mm. The distance between the slots on the longer side is 210 mm. Two (2) screws are needed to mount the product. Follow the instructions below to learn how to successfully wall-mount your Linksys Smart Wi-Fi Router and Linksys EA7500-AH v2. The Wireless Scheduler feature of your Linksys EA7500-AH v2 allows you to turn OFF or ON the wireless networks, including the Guest networks at chosen times. To know more about this, click here. The Linksys EA7500-AH v2 has 880 MHz Dual-Core processor. The Linksys EA7500-AH v2 has a 128 MB flash storage and has a RAM of 256 MB DDR3. The Linksys EA7500-AH is using 1400 MHz dual core processor, the Linksys EA7500-AH v2 has 880 MHz dual core processor. 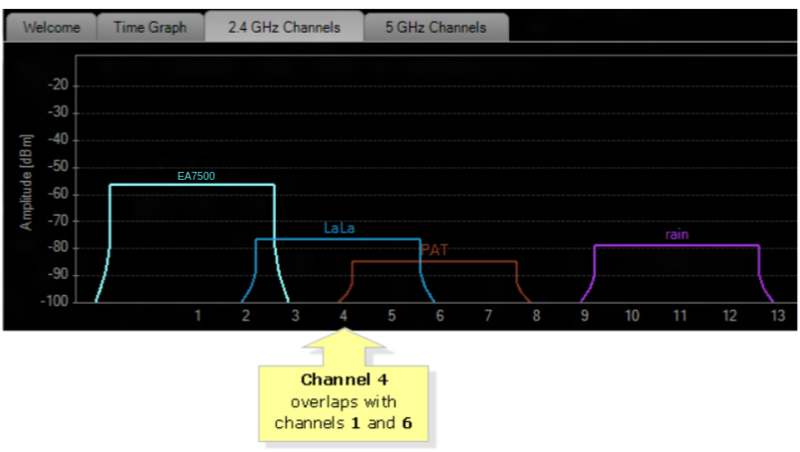 The Linksys EA7500-AH is using 3 x external antennas, the Linksys EA7500-AH v2 has 3 x external + 1 x internal antennas. The Linksys EA7500-AH is delivering AC1900 (N600 in 2.4 GHz, AC1300 in 5 GHz), the Linksys EA7500-AH v2 has AC1900+ (N800 in 2.4GHz, AC1733 in 5 GHz). 1. How do I set up the Linksys EA7500-AH v2? 3. What is the default IP Address and Password of the Linksys EA7500-AH v2? 4. How to enabled/disabled Automatic Firmware Update? Setting up the Linksys EA7500-AH v2 is made fast and easy because of its CD-less setup. Now you can run the setup from a web browser even if the router does not initially have an Internet connection and is on factory settings. For instructions, click here. Whenever new firmware is available, you could set your router to automatic update mode to update its firmware to the latest version. Updating your router’s firmware keeps your router up to date with the latest security fixes, bug fixed, and latest features. Linksys Automatic Firmware updates process happens between 12:00 a.m. and 4:00 a.m. local time. To avoid firmware updates starting at an inconvenient time, kindly ensure that your router is set to your local time zone. 1. What wireless security modes does the Linksys EA7500-AH v2 support? 2. Which wireless connection standards and frequencies are supported by the Linksys EA7500-AH v2? 3. Where can I see the default wireless network name (SSID) and passphrase of the Linksys EA7500-AH v2? 4. How many Guest networks can I set up on my Linksys EA7500-AH v2? 5. Why do you need to change the wireless channel of your router? 6. Why should I enable automatic firmware update? How do I enable it? 7. 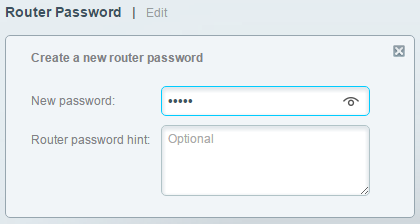 Why should I change router administration password? And how do I change it? 8. Why should I change wireless authentication password? How do I change it? 9. Why should I enable router SPI Firewall? And how do I enable it? 10. What is Wi-Fi Radio Frequency? 11. 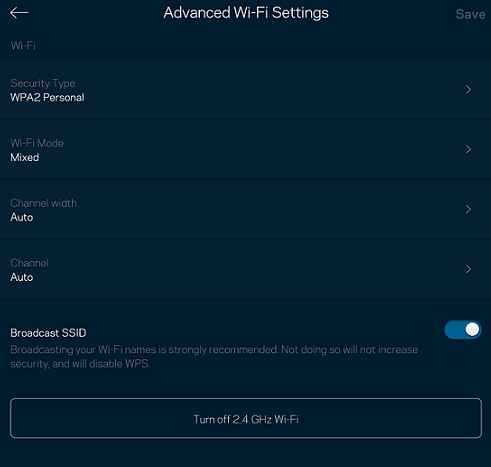 How to change the Wi-Fi setting using Linksys Apps? 12. How to change the Wi-Fi setting using Web Browser? 13. 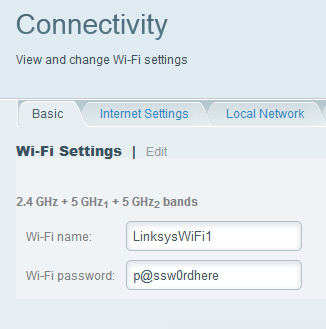 How to check and update the router password using your Linksys cloud account? 14. What is the recommended connected devices for EA7500-AH v2? The Linksys EA7500-AH v2 supports WEP, WPA2-Personal, WPA2-Enterprise, WPA2/ WPA-Mixed Personal and WPA2/ WPA Mixed-Enterprise. The Linksys EA7500-AH v2 is compatible with 802.11ac, 802.11b, 802.11g, 802.11n and 802.11a. It supports the 2.4 GHz and 5 GHz frequencies. 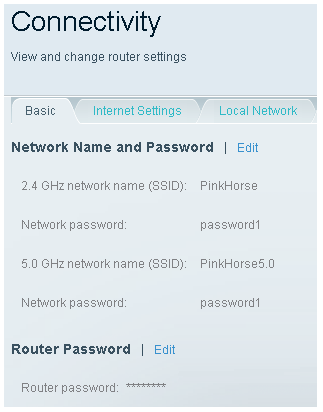 The default SSID and passphrase can be located at the bottom label of the Linksys EA7500-AH v2. The Linksys EA7500-AH v2 allows you to have two (2) Guest networks, one for each band (2.4 GHz and 5 GHz). With these, your visitors at home can access the Internet but not the local network (i.e., shared storage devices, printer access). These factors can reduce your network’s performance. Changing channels is one of the best ways to resolve intermittent signal and to optimize your wireless connection. The Wi-Fi password is NOT the router password. Changing your Wi-Fi settings will disconnect all devices from your router. Images of the web-based setup page may differ depending on your router’s model number. Access your Linksys cloud account. Changing the wireless channel lessens the interference to your Wi-Fi connection. If you want to make any changes in the future, you can access your Linksys cloud account within your local network or remotely. The information below will further explain and differentiate your Linksys dual-band router’s wireless channels. Since EA7500, PAT and rain are 5 channels away from each other, their signals don’t overlap. On the other hand, LaLa, despite being on a different channel, interferes with EA7500 and PAT. If you still experience connection problems after changing the wireless channel, you might need to add another device to your home network such as a switch or range extender. This way, you can connect more devices to the network and extend the wireless network range. Automatic Firmware Update is an important feature to keep your router fresh with the latest updates and security patches which enable the router to periodically check for the latest firmware available from Linksys cloud. This feature allows you to have a peace of mind when coming to home networking. By following the setup wizard, the router will automatically check for the latest firmware and turn-on the Automatic Firmware Update. It is RECOMMENDED to follow the setup wizard to ensure all the setting are properly configured. To turn-on this feature, go to Connectivity -> Basic -> Checked the “Automatic” button. Note: This feature is a recommended setup to protect Linksys’ customers from any unintended security threat. By following the setup wizard, Linksys firmware will guide users to modify this parameter from its default value. 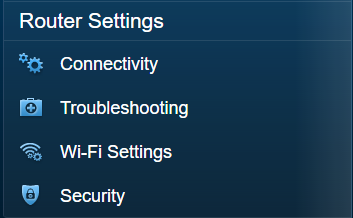 If manual setting is selected, Linksys recommends users to change these configuration (Automatic Firmware Update, Admin Password, Wi-Fi Password, SPI Firewall) immediately. Router admin password is the first layer of security measurement when accessing your router’s GUI. By changing the default ‘admin’ password will prevent anonymous person to take control of your home router. Follow the setup wizard, the router will prompt to change the router’s administration password. It is RECOMMENDED to follow the setup wizard to ensure all the setting is properly configured. To change the Router’s default password, go to Connectivity -> Basic -> click the ‘Edit’ icon at Router Password. By following the setup wizard, the router will prompt to change the Router’s wireless password. It is RECOMMENDED to follow the setup wizard to ensure all the setting is properly configured. To change the router’s wireless password, go to Wi-Fi Setting -> Wireless -> change the Wi-Fi password under each radio. Linksys SPI Firewall Protection feature keeps track of the state of network connections traveling across it. This feature protects your internet connection against threats and Denial of Service (DoS), and any other security loopholes. 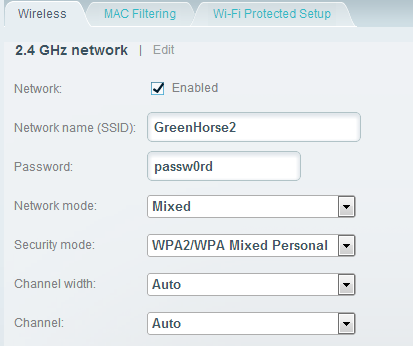 Linksys router enables this feature by default. It is RECOMMENDED to keep the Firewall enabled. If this feature is disabled by accident, to enable router’s SPI Firewall, go to Security -> Firewall -> checked IPv4 & IPv6 SPI Firewall protection. A 5 GHz network has a lower chance of picking up interference because most wireless devices such as Bluetooth devices, cordless phones, microwave ovens, and computers use the 2.4 GHz frequency. IMPORTANT: Setting the channel width to 40 MHz on a 2.4 GHz network will allow you to use 2/3 of the entire Wi-Fi band, thus having a higher chance of interference. It is advisable to use 40 MHz if you live in areas with less crowded wireless networks. If you’re unsure, you may leave the channel width at Auto. This will automatically adjust the settings to 20 or 40 MHz, depending on which best fits your network. To know when changing the wireless channel is needed, click here. 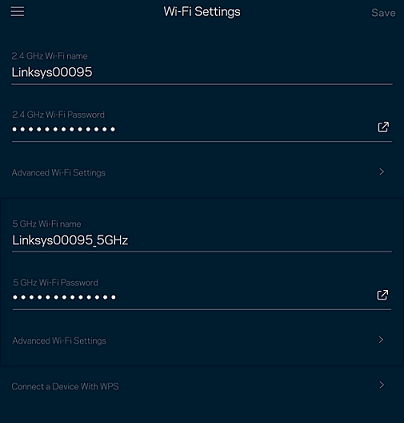 You should now have successfully changed your router’s wireless settings using the Linksys app. The steps below will guide you on how to change the Wi-Fi settings of your router. Use your new password to access your router’s settings such as the Guest Access and Parental Controls. The Linksys cloud account allows you to have the best experience when using your home network. Through this service, connecting wireless devices such as smartphones, tablets, gaming consoles, cameras and wireless printers to the internet is now easier. In theory, routers are able to connect devices more than the recommended quantity, however with consideration of the network and radio performance of each device we recommend that connected devices for EA7500-AH v2 is up to 32 Wi-Fi clients for 2.4G and 64 clients for 5G. 1. How long does it take to resolve an outage? 2. Why are there planned signal shutdowns/maintenances? 3. Why do you need 8 hours for the signal shutdown/maintenance? 4. Why must the signal shutdown/maintenance be carried out on weekdays? 5. Why wasn't I informed of this? The time taken to resolve an outage may differ on a case to case basis. However, please be assured that our engineers are working to restore the service as soon as possible. The planned signal shutdowns/maintenances happen for a variety of reasons. In most cases, they are related to third party requirements like network maintenance or enbloc cable diversion. An approximate duration of 8 hours is required as these activities usually involve major construction works such as excavation and digging of roads. The full 8 hours may not be required, depending on the level of work involved. As most of the maintenances/shutdowns affect residential homes, the intent is to carry them out during weekdays when most people are at work or school. For HDB home owners, a notification letter will be placed in your letterbox if the signal shutdown/maintenance is more than an hour. Notices will be placed at the lift lobbies if otherwise. For landed home owners, a notification letter will be placed in your letterbox. For condominium home owners, you will find notices placed at the lift lobbies.